A goalless draw between Cameroon and Ethiopia helped the DR Congo advance at the African Nations Championship (CHAN) as they beat Angola 4-2. The results mean that DR Congo sit top of Group B on six points while Angola are eliminated after two defeats. Cameroon know a draw in their final match against DR Congo on Monday will be enough for them to go through. Only a big win for Ethiopia against Angola coupled with a Cameroon loss gives them any chance of progressing. Cameroon had the better of the first half, which was held-up for 10 minutes because of floodlight failure, while Ethiopia improved after the break. However it was a dull encounter in Huye after the earlier game when DR Congo raced into a 3-0 lead by half-time against neighbours Angola. Nelson Munganga (pictured), Elia Meschak and Jonathan Bolingi all found the target for the inaugural CHAN winners (in 2009). 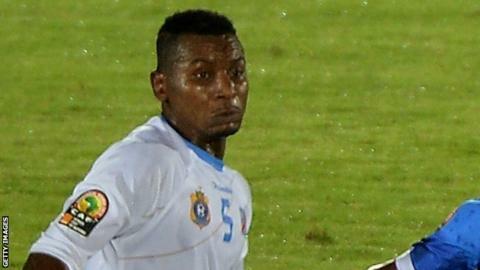 Gelson and Yano hit back for Angola but in between those goals Merveille Bope struck DR Congo's fourth. DR Congo have now scored 7 goals at the tournament after their 3-0 win over Ethiopia, who are yet to score in Rwanda.